The basic environmental problem to be solved as a result of the planned project concerns the absence of effective fish and river lamprey migration along the ecological (habitat) corridor formed by the Parsęta River Basin. The projects seeks to increase biodiversity by restoring the morphological continuity of ecological water corridors in 3 tributaries of the Parsęta River: the Radusza, Gęsia and Perznica rivers. The implementation of the project will lead to the removal of barriers caused by the existing infrastructure and will ensure favourable conditions for free movement of fish species in the SOOS Natura 2000 Dorzecze Parsęty site (PLH320007). The ecological (habitat) corridor will be restored by adaptations of hydraulic structures to the ecology of migratory species such as the river lamprey, the brook lamprey, the atlantic salmon, the bullhead and the loach. The Parsęta River basin represents a relatively coherent ecosystem, but numerous hydraulic structures constructed over many years and excessive discharge of sewage in the river basin resulted in a significant reduction of biodiversity. The implementation of a large water and sewage management project, that included comprehensive upgrading and construction of water and sewerage infrastructure in the 22 townships located in the Parsęta River basin, resulted in a substantial reduction of the amount of sewage discharged directly to the rivers. Consequently, a significant improvement of water quality in the main river channel and in its tributaries was achieved. However, the existing hydraulic structures still hinder or completely prevent fish from reaching spawning grounds or populating favourable biotopes, often located in the upper watercourse. Favourable, natural spawning grounds are identified (among others in the Gęsia, Radusza and Perznica rivers), but access to those locations is seriously hindered or even impossible in some cases. Only a small amount of fish are capable of overcoming obstacles and reaching the above tributaries of the Parsęta. The structures located there prevent further migration of fish upstream. These conditions have prevailed for many years and adversely affected biodiversity in the tributaries of the Parsęta. The goal of the project is to increase biodiversity by restoring the morphological continuity of ecological water corridors in three tributaries of the Parsęta River: the Radusza, Gęsia and Perznica rivers. Natural materials, such as rocks with various diameters, will be used as the principal construction material. 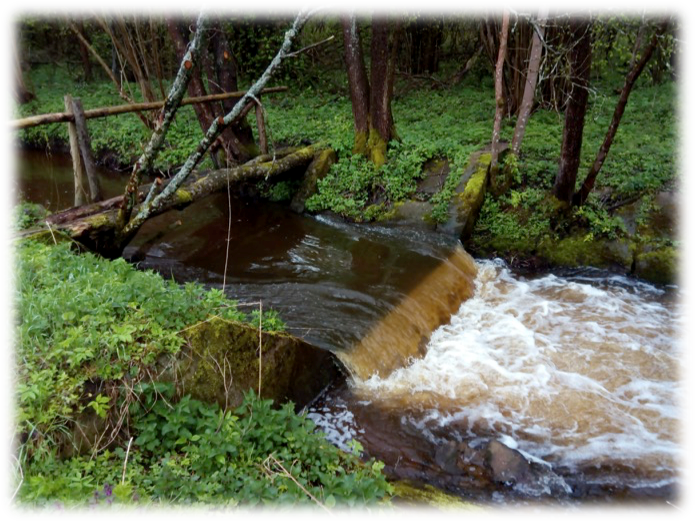 A slope in the bed profile of rapids (a rock bed) will result in a varying water velocity and create favourable conditions for migration of aquatic species all year round.Research on the achieved ecological outcomes is planned as part of the project. It will include the inventory of spawning grounds created as a result of river restoration and the number of fish species and lamprey coming to spawn. The research project will be carried out twice: in 2018 prior to beginning work on river restoration and in 2020, following the removal of the architectural barriers. The research project will be based on electrofishing in selected locations, their description and taking an inventory of spawning grounds. The Union will also constantly monitor the number of spawning grounds and nests of the sea trout and the salmon, including those in the upgraded watercourses, after project finalization during its sustainability period. The main target group of the project is the local community living in the Parsęta river basin. The information and promotional campaign planned as part of the project will contribute to raising awareness for the need to preserve biodiversity and to limiting the scale of poaching activities. By improving the quality of the natural environment in the river basin the project will support building the brand of the region as an area attractive for both, tourists and nature lovers.